This old disease is becoming more common, but it's highly treatable and even curable — with the right care. Unless you've experienced it firsthand or know someone who has, gout may seem like a museum piece of a disease — a condition that once afflicted corpulent men of means but doesn't get mentioned much these days. Even the name seems archaic and unscientific. Gout comes from gutta, Latin for drop, a reference to the belief that it was caused by a drop-by-drop accumulation of humors in the joints. But gout is still very much with us, and the number of Americans affected seems to be increasing, partly because of the obesity epidemic. It remains a disease that mainly affects middle-aged and older men, although postmenopausal women are vulnerable too, perhaps because they lack the protective effect of estrogen. The diuretics ("water pills") that many people take to control high blood pressure are another contributing factor. Gout can also be a problem for transplant recipients. Cyclosporine, the immunosuppressant taken to reduce the chances of organ rejection, is to blame. The encouraging news is that almost all cases are treatable. In fact, gout is one of the few curable forms of arthritis, an umbrella term for dozens of conditions that cause inflammation in the joints. The trouble is making sure people get the care they need and follow through on taking medications. Purines are a group of chemicals present in all body tissues and in many foods. Our bodies are continually processing purines, breaking them down and recycling or removing the byproducts. Uric acid is one of the byproducts and, normally, any excess leaves in the urine. But in some people, the system for keeping levels in check falls out of kilter. Usually it's because the kidneys aren't keeping up and excreting enough uric acid, but sometimes it's a matter of too much uric acid being produced. Gout occurs when surplus uric acid coalesces into crystals, which causes inflammation that results in pain and other symptoms. (Technically, the crystals consist of sodium urate, although for simplicity's sake they're often referred to as uric acid crystals.) The crystals appear most often in the joints, but they may also collect elsewhere, including the outer ear, in the skin near the joints, and the kidney. High concentrations of uric acid levels in the blood — the medical term is hyperuricemia — are necessary for the crystals to form. Yet many people with hyperuricemia never develop gout, and even when they do, they often have had high levels of uric acid in their blood for years without any symptoms. People with hyperuricemia with no symptoms might be coached to make lifestyle changes — losing weight would often top the list — but hyperuricemia by itself is usually not treated. Dr. Hyon K. Choi, now at the University of British Columbia in Canada, and epidemiologists at Harvard have used data from the Harvard-based, all-male Health Professionals Follow-up Study to make a series of comparisons between the 730 men in this study who developed gout during a 12-year period and the vast majority of those in the study who did not. The result is an impressive dossier on the risk factors for gout, at least as they pertain to men. Dr. Choi's findings on weight weren't surprising and fit the stereotype: gout is, in fact, a heavy man's disease. Eating lots of meat and seafood and drinking lots of alcohol spells gouty trouble. And the Homer Simpsons of the world are gout candidates: two-or-more-a-day beer drinkers are more than twice as likely to get gout as nonbeer drinkers, which makes sense, because beer contains a lot of purines. Soft drink fanciers might be in the same gouty boat. High fructose intake was linked to gout in a Choi-led study published in 2008. Uric acid is one of the products of fructose metabolism, and there's good evidence from controlled feeding studies that fructose increases uric acid levels in the blood. Much of the fructose in today's American diet comes from the high-fructose corn syrup (which is about half fructose and half glucose) that's used to sweeten soft drinks. High blood pressure is another major risk factor for gout. It gets complicated, though, because the diuretics taken to lower high blood pressure increase uric acid levels, so the treatment as well as the disease are associated with the disease. Finally, while gout does run in some families, genes don't seem to play a pivotal role. Most people who develop gout don't have a family history of the disease. Gout is not gout until symptoms occur. When they do, they usually come on suddenly and, at least initially, affect a single joint. Within hours, that joint becomes red, swollen, hot, and painful — they're called gout attacks for a reason. It's easy to mistake a gout attack for a localized infection of a joint. The metatarsophalangeal joint at the base of the big toe is often the site of the first attack, but the knees, ankles, and joints between the many small bones that form the foot are also targets. People who already have osteoarthritis — the most common form of arthritis — often experience their gout attacks in the joints of the finger. One of the mysteries of gout is that the attacks often completely subside after a few days. Sudden onset followed by complete resolution is a feature of gout that distinguishes it from other sorts of arthritis. Even without treatment, people may not experience another gout attack for years. But there's also a chance that the attacks will escalate, coming on more frequently and lasting longer. When that happens, some people develop tophi — large, visible nodules made of uric acid crystals. Tophi can be large and disfiguring and may erode nearby bone tissue. They were once a common feature of gout, and a reason the disease has been so notorious. These days tophi should occur rarely, if ever, thanks to the availability of drugs to control uric acid levels. When they do occur, the uric acid–lowering medications will usually shrink them. Kidney stones are a complication of gout because extra uric acid can collect in the urinary tract and crystallize into stones. Very rarely, the crystals form right in the kidney and cause serious kidney problems. But it's the same story as with tophi: these problems are less common now that uric acid levels can be controlled. 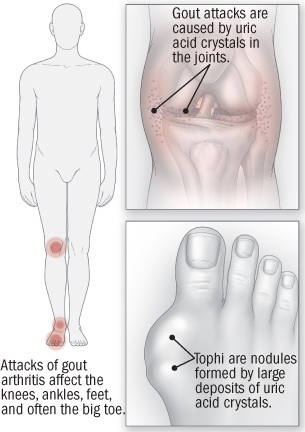 Gout has been associated with an increased risk for heart attacks. High uric acid levels may affect the smoothness of the inside of blood vessels and make platelets in the blood "stickier," so blood clots are more likely to form. For reasons that still aren't understood, uric acid levels in the blood sometimes go down when someone is having a gout attack, so a blood test at the time of an attack is not a reliable way to diagnose gout. Instead, doctors use a special polarizing light microscope to look for uric acid crystals in a small sample of fluid drawn from the afflicted joint with a syringe. There are several arthritic conditions caused by crystal deposits of various kinds, and polarizing light microscopy is essential to distinguishing among them. The most common of these other disorders has a misleading name, pseudogout (it may not be gout, but there's no question that it's real); it's caused by deposits of calcium pyrophosphate dihydrate crystals in the joints. As is true for many painful conditions, the first-line treatment for a gout attack is taking one of the nonsteroidal anti-inflammatory drugs (NSAIDs), such as diclofenac, ibuprofen, or indomethacin. For people who can't take NSAIDs, a drug called colchicine is an alternative. It's been used for centuries — maybe even longer — specifically for gout. The trouble with colchicine is its side effects, especially the copious diarrhea. If neither an NSAID nor colchicine is an option, then gout attacks can be treated with an oral corticosteroid, such as prednisone, or with corticosteroid injections into the joints. For years, gout patients were told they had to follow a purine-restricted diet to stave off attacks, but those diets weren't very effective and people had a difficult time sticking to them. Now the easier-said-than-done advice is to lose weight, and also to cut back on alcohol, especially beer. Big meat and seafood eaters may be told to curb their appetites and instead eat more low-fat dairy foods. Diuretics tend to increase uric acid levels. If someone with gout is taking one, a doctor might explore lowering the dose or switching to a different medication. But the most important fork in the road for gout sufferers is whether to start taking a drug that will lower their uric acid levels. Once people start taking these drugs, they usually must take them for the rest of their lives. Going on and off a uric acid–lowering medication can provoke gout attacks. Experts have differing opinions, but many agree that the criteria for starting therapy include frequent (say, three times a year) attacks, severe attacks that are difficult to control, gout with a history of kidney stones, or attacks that affect several joints. Another quirky aspect of gout is that uric acid–lowering medications can't be started during an attack because they can make the attack worse. Allopurinol has emerged as the first-line uric acid–lowering drug because it needs to be taken only once a day and reduces uric acid levels regardless of whether the root problem is overproduction of uric acid or inadequate clearance by the kidneys. Sometimes people develop a mild rash when they start allopurinol, although rarely there's a dangerous allergic reaction. Guidelines warn against prescribing allopurinol for people with kidney disease, but if it's a mild case, the drug is usually well tolerated. Underdosing has long been a problem. The standard daily dose of allopurinol is 300 milligrams (mg), but that might not be enough to reach the commonly accepted target level for uric acid of 6 milligrams per deciliter (mg/dL). Most people can take doses of 400 mg (or even more) without any problems, although higher doses do mean taking extra pills. A new drug, febuxostat (Uloric), is similar to allopurinol in the way it works. In head-to-head trials, febuxostat looked to be more effective than allopurinol at controlling uric acid levels, although that may have been because the allopurinol dose in the study was too low. As a new, brand-name drug, febuxostat is far more expensive than allopurinol. Probenecid is a third choice. Like allopurinol, it's been on the market for decades, so it has a long track record. Probenecid works by increasing uric acid excretion by the kidneys so it can trigger the development of kidney stones and is not a good option for people with kidney problems. Another drawback to probenecid is that it has to be taken twice a day. Perhaps the biggest problem with the uric acid–lowering therapy is sticking with it. A study done several years ago showed that over a two-year period, less than 20% of patients on allopurinol were taking it as prescribed. Poor adherence is understandable. Once people are taking gout prevention medicine, there are usually no immediate symptoms to remind them to take the pills daily. And the memory of the last attack is bound to fade, no matter how excruciating it might have been. The Health Letter thanks Dr. Robert Shmerling for his help with this article. Dr. Shmerling is the clinical chief of the Division of Rheumatology at Beth Israel Deaconess Medical Center in Boston.